Parents, are you looking for something affordable, fun and exciting for your child during the Winter Break? 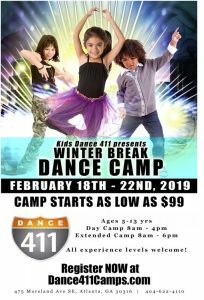 Dance 411 has your solution! Early Special $99 through February 10th, 2019. Full Week regularly $159. Enroll your children in dance camp with the dance studio voted “Best of Atlanta”! Our dance camps are approved through Georgia’s “Bright From The Start” Department of Early Care and Learning. Camp will run Monday, February 18, 2019 through Friday, February 22, 2019. Sessions are daily from 8:00 a.m. to 4 p.m. After care available until 6;00 pm for an additional $12 per day. Registrations are taken from ages 5–13, and camps are broken into different groups based on volume of students in each age bracket (example 5 – 8, 7-9 and 10 – 13). During camp, sessions feature performance training and workshops in varying dance styles including technique , hip hop and jazz and a few specialty classes such as Break Dancing and Step.